When I was looking at an apartment in Georgia, (see more posts on small space living here)I noticed that there was a small linen closet in the bathroom. I would have to give a big hooray!! for that. I love linen closets and I was thinking how nice it would be to remove the door and have it be not only functional, but pretty. 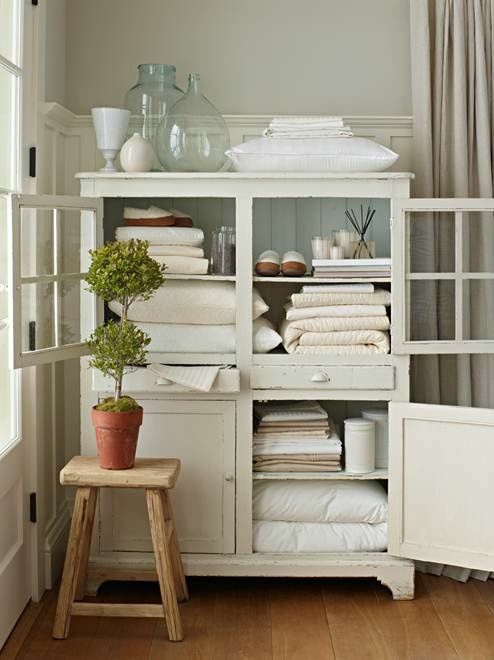 I love this linen closet. 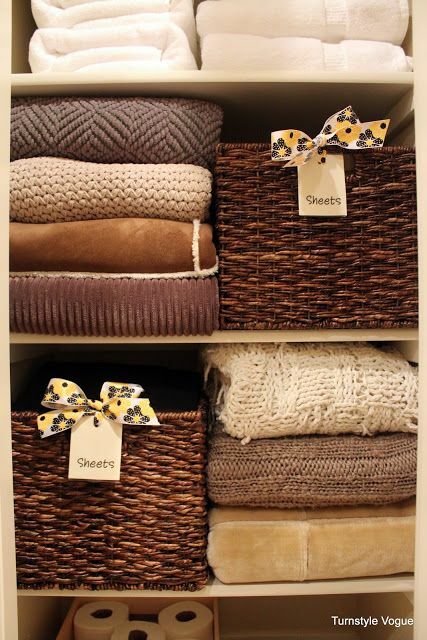 I don't think I know that I have never had a linen closet that was this neat and organized. How clever that she has not only put things in baskets, but she has labeled them so prettily. In all honesty, I'm not sure I have that much time or energy, but I do love the idea of baskets. I am definitely a basket girl. I guess there could be some definite benefits to leaving the door on. Of course this is a built-in, but I like the idea of the hanging shelves on the inside of the door. A definite space saver in a small apartment. 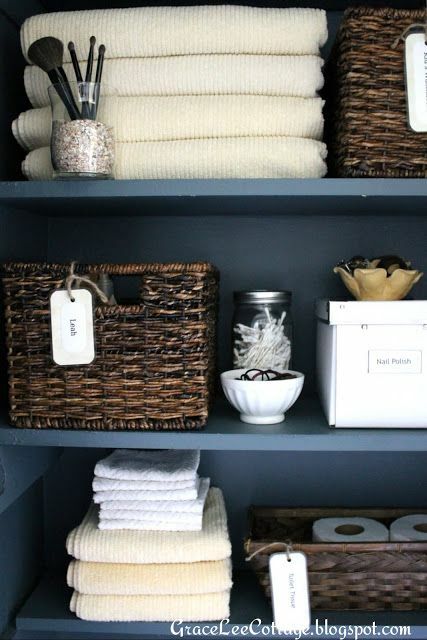 I love the use of the pretty canisters and glass jars in this linen closet. Oh, and white towels. I only use white towels. I can do that now that I am on my own. More labeled baskets. That seems to be a pretty popular theme on Pinterest. This is an interesting idea for bed linens. I'm not quite sure how I feel about this one. What do you think? 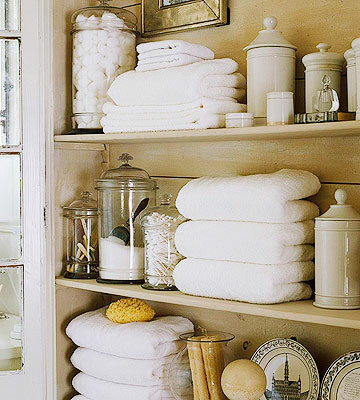 I love the idea that if you don't have a linen closet that you can create a beautiful one. I think that one was pretty perfect. I was a bit disappointed in what I found on Pinterest. I guess there are only so many things that you can do with a linen closet. Storing toilet paper just isn't that exciting. P.S. I've just started a new board on Pinterest called Small Space Living. You can find it here. Laura - I'm going thru the same thing as I'm preparing to redo both of my bathrooms. My hall bath has a linen closet that is 36" wide and 36" deep from floor to ceiling. I have found things in the back of those shelves that I do not even remember having. LOL I'm going (I think) with roll out shelves simply to utilize that back space. Like you, I haven't found much on Pinterest. oh, i just love that last image. not sure about the labeling things behind close doors unless the baskets are hard to figure out? 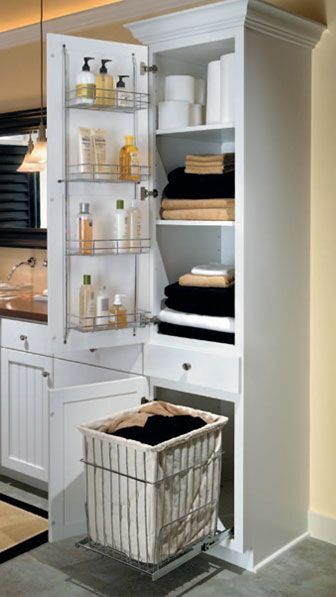 I don't have a linen closet in my bathroom :( but I did put a bakers rack in there with baskets. I'm still in making it pretty mode but I like how it looks so far. I like the idea of taking the door off....would make it easier to get things out, too. My closet is in the hallway though so I can't do that. Love the small space ideas! I'll look at your new board! Happy weekend my friend! Hugs! I have a linen closet in both of my bathrooms but I store more than linens in them. Since the door is on them, I can hide almost anything in them! LOL! Those are some great inspiration photos. I don't have any linen closet and for now storing things is a bit of a nightmare... But that last picture, wow... I need one like that when I redo my bedroom! Martha Stewart does suggest that you consider keeping top and bottom sheets together by storing them inside their pillow cases. But I envisioned that sheets would be folded very neatly and placed equally neatly into one of the cases, and folded over one time, ending up in a stackable, square shape. I don't care for these plops of sheets tied on top. I like to see crisp folds (but I still have some difficulty folding fitted sheets even though I have watched the Pottery Barn video a few times on how to do it).